While the ole blog has been quiet this summer, there was actually a ton of stitching going on around here. I'll post some updates on some of the fun projects I completed, but today is all about one of my favorite new embroidery books from one of my favorite embroiderers. Carina Envoldsen-Harris was one of the first internet hand embroidery pals I made years ago. Her work is always beautiful and colorful and blissfully organic. She has a great signature style, and I was thrilled to see she'd be sharing her work in a book. Stitched Blooms is a great embroidery resource for beginning stitchers, and great inspiration for seasoned stitchers. If you're new to embroidery, Carina has a great introductory portion in Stitched Blooms that is filled information on tools and tips to get you started. Her individual stitch diagrams and instructions are very easy to follow. After the informative introduction comes a great selection of 20 projects that feature Carina's beautiful stitched blooms. 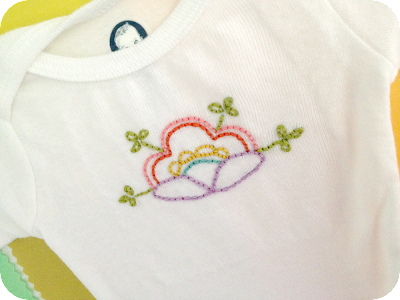 Some involve stitching on ready-made items, while others include additional simple sewing. I'm particularly smitten with this Dala Horse, and these little pom pom luminaries are adorable and practical. Finally, Stitched Blooms includes an impressive 300 motifs for stitching on anything your heart desires. A CD is included so you can download and resize the images to suit your particular project. This is one of my favorite features. Carina's book and CD came in handy recently as I was trying to come up with a little something for a friend who was having a baby. I got a text message that she was in labor, and though I'd already sewn a few other simple gifts, I thought it would be fun to stitch something for her daughter while she was in labor. I popped the CD in to my computer and found the image that corresponded with the one I'd picked from the book, resized it to fit the onesie and printed it out. I used my tried-and-true method for transferring images on to fabric (dressmaker's carbon paper) and set to stitching. The design was simple enough that I was able to easily complete it in a couple of hours, and it was fun to do something for my friend while she was in labor. It felt like a special way to keep her in my thoughts while she was working so hard to bring this sweet new life in to the world. Carina's Stitched Blooms is a fantastic book for stitchers looking to be inspired by color and nature. She has a unique way of creating organic designs that can also feel very graphic and modern. 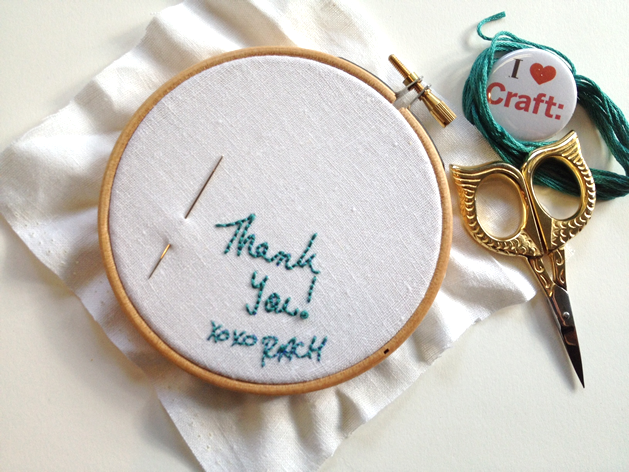 It's a great addition to any embroidery fan's library! Disclosure: I was provided with a complimentary copy of Stitched Blooms to review, but the opinions expressed are 100% my own! Back in February, I was lucky enough to be an instructor at the inaugural QuiltCon in Austin. The Modern Quilt Guild did a spectacular job of putting on this quilt show and fabulous workshops and lectures. I taught a class called "Redwork in Modern Quilting" in which I looked at the tenets of traditional redwork embroidery and aligned them with the tenets of modern quilting to create my take on redwork embroidery in modern quilting. We then got down to the work of basic hand embroidery. It felt so good to be teaching again (that's been one of the things I've missed most about leaving Austin and the Stitch Lab). I was a little nervous about the subject of the class. It was one that was presented to me, and they let me run with it and teach it as I saw fit. 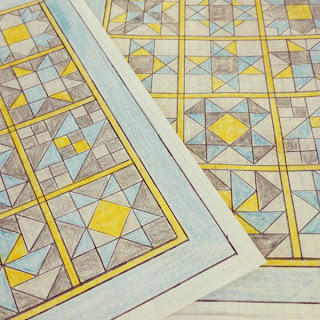 It ended up being great fun to research traditional redwork and see how we could translate that into modern quilting. It also gave me the opportunity to make my second quilt top that I used for the example in my class. It's the Marquee pattern from the Modern Quilt Workshop book. I felt it was a nice modern take on that classic patchwork feel of traditional quilts. Sewing the strips together was dreamy, and it made me want to make one big ole giant striped quilt somewhere down the line. I was able to get a new sewing machine right before Christmas (nothing overly fancy or expensive, but just enough of a step up that it made a huge difference for me), and that puppy was singing while I sewed, sewed, sewed, and cranked the quilt top out in just a couple of afternoons. I had a blast. The vendor booths were awesome, particularly the Stitch Lab booth. I know, I know, I'm a little biased, but DEEEEEYAM. Those ladies outdid themselves. The fabric was phenomenal, the booth layout was perfect, and it was a smokin' hot hub throughout the entire show. It made me miss them even more! One of the best parts of QuiltCon was getting to see so many good friends, but even better was getting to hang out with my aunt, Terry, who came down all the way from Santa Fe, New Mexico to take my class and attend QuiltCon. Aunt Terry and I have bonded over quilting, and it's been great fun to connect with her in this way. We've always loved her family, and this gives us even more reasons to stay in touch and have fun together. She became know as, "AUNT TERRY!" as we walked around the show and she met my friends. We had a great time looking at quilts, visiting vendors, and she even got to experience her first photo booth, which was a total riot. I loved having her there! The quilt show itself left me completely in awe and inspired. I went through it several times, and found new things each time that I did. I took as many pictures as I could, but often found myself so inthralled in the quilts, that I forgot to whip out my phone to snap a picture! I also tried to take a picture of the quilt, followed by a picture of the information about it. I wasn't able to do that every single time, but I did get quite a few. There were several times where I'd fall in love with a quilt, and then read the story behind it, and fall in love in a whole new way. The stories behind the quilts and how they were made were fascinating! I've loaded all my pictures into a Flickr set. I'm still working on labeling, etc. but it's an easy way to look through them all. Enjoy! Last fall, I took my first quilt class. I was terrified and not sure how I'd do, but I was also excited to try something new. And though I started out shaky, within a few weeks I got my quilting legs and took off and fell madly in love with this medium. Since then, I've complete another quilt top, taught at QuiltCon and am diving into my third quilt this week. Before I fill you in on all those things, here's a look at my first quilt process and some of the things I learned. Taking a quilt class made a huge difference. I have a hefty stack of quilting books that I love, but taking a class really helped me understand how quilts come together, and made the books make more sense. Having a person who can answer questions and share their personal tips was infinitely helpful. Now I can tackle quilts I see in books with confidence. 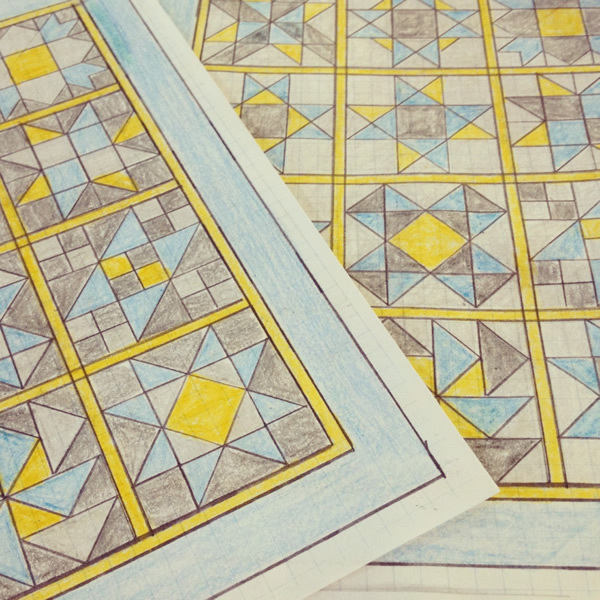 It was also fun to watch a group of students take identical patterns and create such incredibly different quilts. I loved it. It pays to press. My sewing guru, Leslie, always said, "It pays to pin!" in our sewing classes, and she's right. The same saying can go for pressing when it comes to quilting. I won't iron clothes to save my life, but give me seams to press and I'm all over it. Mistakes are no big deal. I don't have a picture of it, but once I pulled my quilt out of the dryer, I was fondling it with glee (get yer mind out of the gutter!). My hand came across a seam in the middle of a block that had come completely out. At first, I was horrified, but then I thought it'd be a perfect place for a little embroidery. Maybe even a stitched "oops." No biggie. Seeing your kid snuggled up under a quilt you made while they watch tv is pretty freaking awesome. After all the time and energy (sweat and tears, of course) I put in to this quilt, the happiest I was came when my son grabbed it off a chair and curled up underneath it. So in love. Keeping it simple made it doable. The quilt blocks themselves were pretty involved, so I went super simple with the quilting (an aesthetic I prefer anyway) and kept the binding simple by just doing it all by machine. I thought this might be a "cheater" method of binding, but it turns out some of my very favorite quilters use this method exclusively. It felt great to finally tackle making my own binding and being able to attach it in one run through the machine satisfied my need to git 'er done. 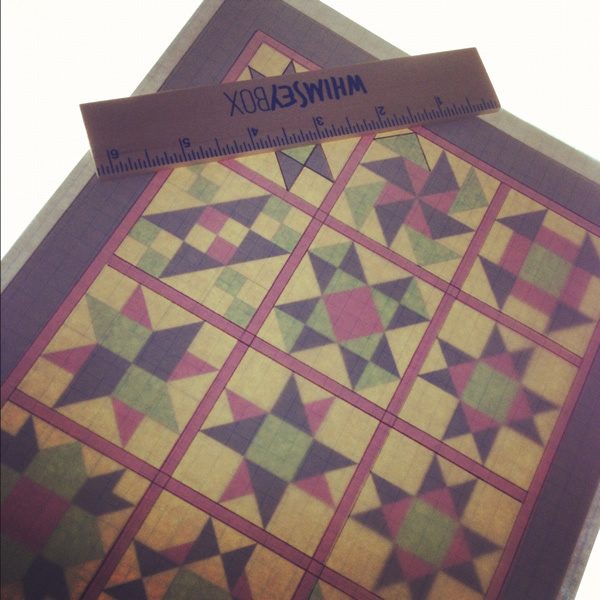 I kept Susan Beal's Modern Log Cabin Quilting book right next to me during the entire binding process. Her instructions were so easy to follow, and eased all my binding fears. "Show Me a Story" Winner! 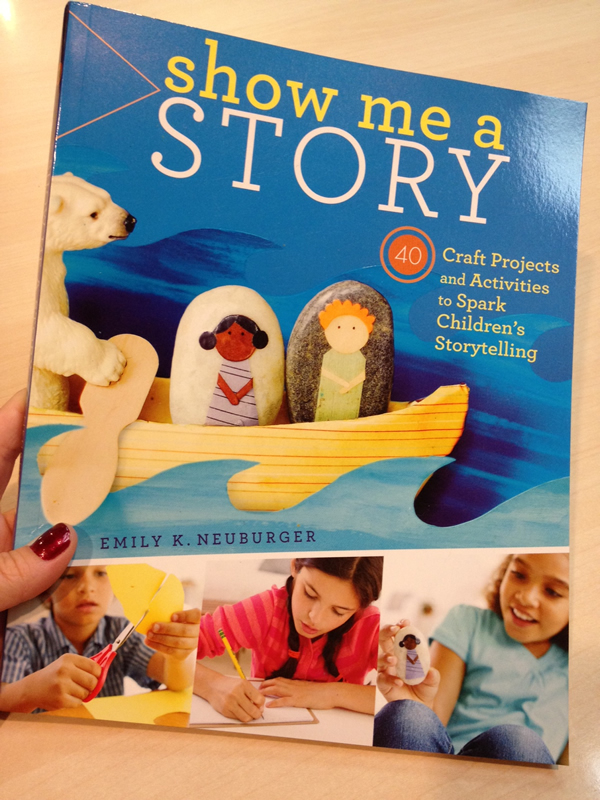 Thanks to all who commented for a chance to win a copy of Emily K. Neubuger's Show Me a Story. I truly love this book, and even if you didn't win, I encourage you to grab a copy for yourself or follow her blog tour for another chance to win a copy. 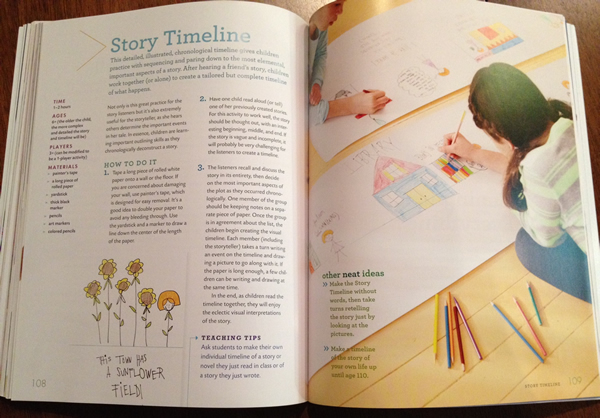 Congrats to Arielle Clementine who said, "i am planning on homeschooling my kids, and feel like this book would be a wonderful way to get them interested in storytelling!" 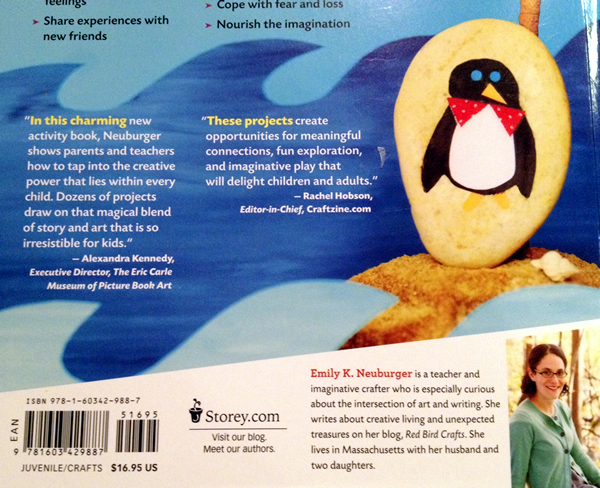 I'll be in touch, Arielle, to get your copy of Show Me a Story headed to your home. Stay tuned for updates on my quilt class and my first-ever quilt block. Spoiler: I didn't die from fear over making it. One of my favorite things about the time I spent at CRAFT was finding and following so many immensely creative folks through their blogs. I love stumbling on new blogs, keeping up with them, and watching them grow over the years, and it's even more exciting to see them make the jump from blog publishing to book publishing. One such case is Emily K. Neuburger of Red Bird Crafts, whom I first connected with a couple of years ago after posting about some of her projects on CRAFT. I've followed her work and stayed in touch ever since, and was thrilled to se her new book, Show me a Story, that has "40 craft projects and activities to spark children's storytelling." The Story Disks project is simple and cute, and will end up providing hours of creative play for kids. As a mom, I have to admit that when I've tried to craft with my kids, they don't always jump right on board. They seem to need some kind of additional hook to get going. What I love about Show Me a Story is that the projects have purpose. It's not just about making something cute, it's about making something that you then turn around and use to share creative stories and adventures with others. That bumps the awesome factor right up through the roof for me. The Storytelling Jar is an adorable project that would look cute on a desk or shelf, and can then be pulled down to use for story telling whenever the mood strikes. The projects are mostly pretty simple, and use basic materials that can often be found around your house (even in the recycling bin!) 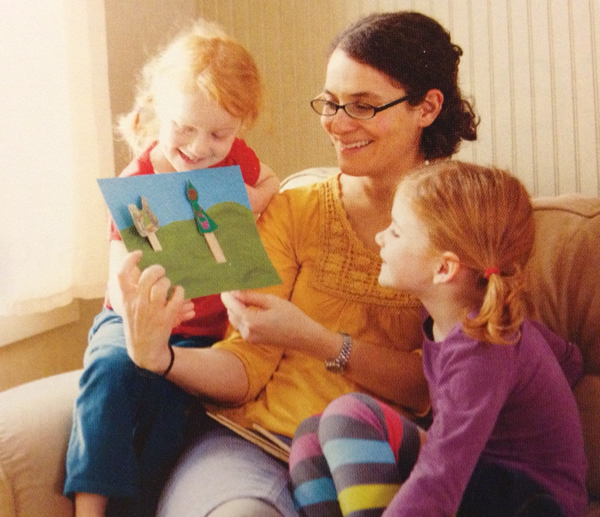 so it's a great book for families to have on hand for rainy days, family activity nights or summer boredom busting. It's also a book that would be a great gift for teachers, because many of the activities would be perfect for the classroom. Emily's thoughtful and thorough explanations of the mechanics of stories, and her rich prompts help readers jump right in to the story-telling process. 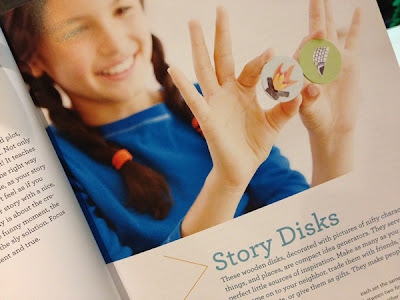 Emily doesn't just provide craft project tutorials in the book, but she also includes incredibly helpful guides for getting kids in the right mindset to fall deep down the story telling rabbit hole. 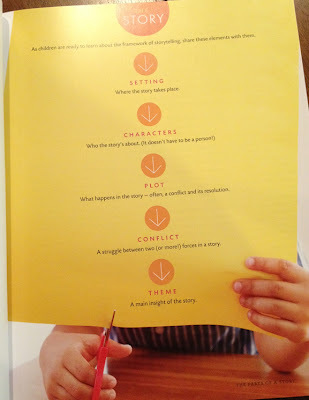 She's prepared rich lists of prompts and explanations that help parents or teachers put the activities in to context for the children. Show me a Story is filled with the kind of projects and inspiration that help create special moments between adults and children, and it's really refreshing to see this kind of take on a craft project book. I like when there is purpose to a project beyond just making it. If all this resonates with you, you're in luck! I have one copy of Show me a Story to offer for giveaway to an Average Jane Crafter reader. Just leave a comment on this post, telling me how you would use this book with the kiddos in your life, and I'll draw a winner at random on Monday. You have until 9PM CST on Sunday, September 29 to leave your comment. Sorry, contest is open to U.S. residents only. Cutting precise straight lines scares the heck out of me, y'all. 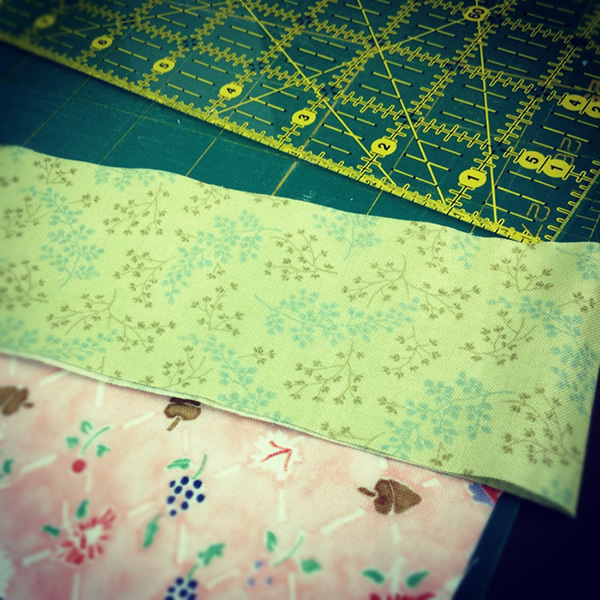 Last week, I started my first quilting class. I've been meaning to try my hand at quilting for a while, but the right moment hadn't hit me yet. After being invited to teach a hand embroidery workshop at QuiltCon, I decided this was the perfect time. This fall would be the time I finally learn how to make a quilt. 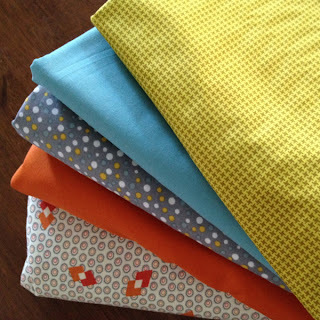 My initial fabric selection - I thought we needed five fabrics, but it turns out we only needed four. I had to change this grouping up a bit. 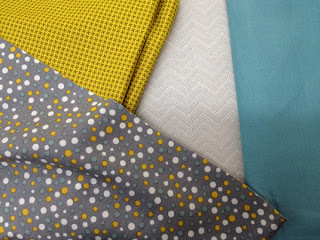 I decided to get my fabrics before the first class, and had a lot of fun browsing through bolts. Though the quilt we'll be making in class isn't my particular style (it's very traditional piecing, and I'm drawn more to the graphic modern quilts) I'm excited to be learning so many techniques, and decided I'd try using more modern-feeling fabrics in the quilt. I figured I need to be in love with the fabrics so I can spend the next eight weeks staring at them, and the next who-knows-how-many-years using the quilt. 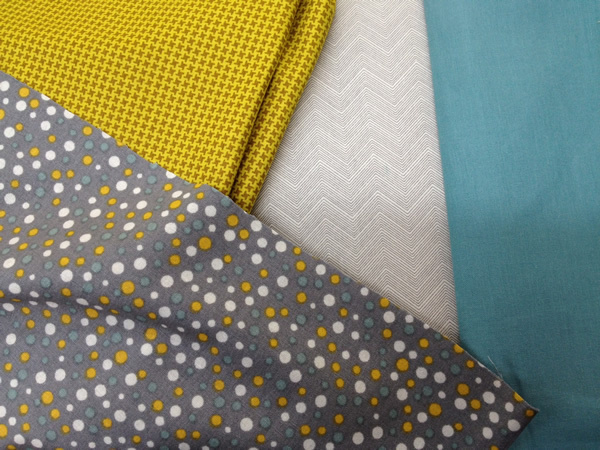 Even as enjoyable as shopping for fabric is, though, an unanticipated feeling emerged as I picked up, swapped out and debated different fabrics: terror. The reworked fabrics for the quilt. I actually like this grouping better! You see, I haven't tried any big new skills lately. I've been pretty darn comfortable with my infatuation with hand embroidery and dabbling in other simple crafts, but I haven't really s t r e t c h e d much outside of my comfort zone recently. Quilting is big, and pretty foreign to anything I've ever done. Sure, it's fabric and sewing, but it's also precision, straight lines, matching points, perfect quarter inch seams*, basting, binding and ... quilting! All these things are not in my usual bag of tricks. I'm a fly-by-the-seat-of-my-pants kind of crafter. I take pride in not worrying if my seams are 100% perfectly straight. Quilting is going to take some time and thought and purposeful action. There will be lots of practicing on scrap fabrics, lots of measuring and remeasuring, and most certainly, without a doubt ... lots of mistakes. I nerded out and used my light box to make a copy of the quilt pattern so I could color it in with different colorways and decide which fabrics I wanted to use in which ways. Don't laugh - it's super handy! I don't shy away from mistakes, and I love learning new things, but when I showed up to my class and realized I was the only one who hadn't made a quilt before (hey, it's an *intro* to quilting class, I didn't think it would be so odd that I hadn't made a quilt before!) I felt the terror creep back up. I'm typically outgoing and enthusiastic in a class environment. Instead, I became intensely introverted and ... I'll say it ... scared out of my wits. My quilt ruler was futzy, my machine borked out on me, and there were a million other little things that just made the evening a bit crazy and uncomfortable ... and terrifying. I made photocopies of the tracing and then colored them in, swapping my light and dark grey fabrics. I'm a super visual gal, so this helped me get a better idea of how swapping the fabric placement would affect the overall look of the quilt. See? Handy! It took a stiff cocktail when I got home to try to relax and remind myself: THIS IS ONLY QUILTING. I need to take my own advice and not stress. I need to have fun. I've said this a million times to my embroidery students: The more you have fun, the more inclined you will be to practice. The more you practice, the better you will get. I need to stick with that, but I'm also kind of ok with being terrified. This kind of terrified is a feeling I haven't had in a long time, and it's reminding me I'm alive and pushing myself. Somedays the routine of family life makes me feel like I'm not doing much of those things. And I'm a process gal, which means - even when terrified - I actually really enjoy the process of being a bumbling idiot with something new, and slowly working to a point of comfort. I think it's a good thing for my kids to see, too. They see too many perfect, edited "final results" throughout media. They need to see some of that raw process (even if it includes a few swear words, I'm not gonna lie). What has terrified you lately? * Ironically, I'm the youngest person in the class, but I have the most basic, simple sewing machine in the group. Most of the others have super fancy computerized machines with special settings and presser feet that make precise quarter inch seams a snap. My machine ... notsomuch. But I keep thinking, "come on! Pioneers had flippin' FOOT POWERED machines!" and then I feel better. Give it up for new beginnings, y'all! Oh, my dear, sweet little neglected blog. I've missed you. There has been a lot of change around these parts over the last nine months or so, and that's contributed to my lack of posting. Fortunately, I'm getting back on track, and really looking forward to getting nice and comfy back over here. The biggest crafting-related news around here is that, after four years, I left CRAFT at the end of June of this year. I loved blogging there, and am thankful for all the wonderful people I met and inspiration I found, but after blogging and being editor there, I decided it was time to move on to some new creative endeavors. I am thrilled to be working with Alicia and Bri at Whimseybox, which is based right here in Houston. It's exciting to be even a small part of a new and growing venture, especially when I admire the women behind it so much. I've had fun blogging for them and creating project tutorials (something I hadn't done in ages!) and am even more excited for what the future holds for Whimseybox. I'm also excited to announce that I'll be teaching at the first ever QuiltCon in Austin next February. I'll be teaching basic hand embroidery in the context of studying redwork in modern quilting. I can't believe I'm part of this incredible event. I mean, hi ... Anna Maria Horner, one of my all-time biggest design inspirations and first fabric designer crush, is teaching in the same room I am right after my class ends. Who wants to place bets on me passing out? If you are interested in the class or QuiltCon, be sure to check it out and sign up soon. As of a few days ago, there were less than three spots left in my workshop. The QuiltCon folks have been amazing and so professional. This is going to be a top-notch event. I can't wait! Speaking of quilting, I'm starting my first quilting class next week. Yep. I've never made a quilt (well, not an official quilt - I've "quilted" a few small things for fun/practice, but I've never done a whole quilt start-to-finish before). Even though my workshop at QuiltCon isn't so much about quilting (it's a basic hand embroidery class) I didn't feel I could stand up as a teacher there, having never made a quilt. I've read Susan Beal's Modern Log Cabin Quilting book cover-to-cover, and am ready to get some real-life action going in the quilt department. Look for updates over the coming weeks as my class progresses! 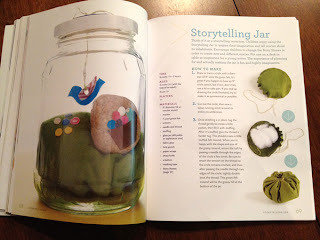 I've got some great books and craft goodies to share with you, as well as some fun project tutorials, soon. Thanks for sticking with me - even with my sporadic posting. This fall marks the 5th anniversary of Average Jane Crafter, and I'm so glad to still be crafting and sharing things with you!